Gas pressures in the atmosphere and body determine gas exchange: both O2 and CO2 will flow from areas of high to low pressure. Atmospheric pressure is the sum of all the partial pressures of the gases in the atmosphere, including oxygen, carbon dioxide, nitrogen, and water vapor. In the atmosphere, the partial pressure of oxygen is much greater than the partial pressure of carbon dioxide. The partial pressure of oxygen in the atmosphere is much greater in comparison to the lungs, creating a pressure gradient; this allows oxygen to flow from the atmosphere into the lungs during inhalation. The respiratory process can be better understood by examining the properties of gases. Gases move freely with their movement resulting in the constant hitting of particles against vessel walls. This collision between gas particles and vessel walls produces gas pressure. Air is a mixture of gases: primarily nitrogen (N2; 78.6 percent), oxygen (O2; 20.9 percent), water vapor (H2O; 0.5 percent), and carbon dioxide (CO2; 0.04 percent). Each gas component of that mixture exerts a pressure. The pressure for an individual gas in the mixture is the partial pressure of that gas. Approximately 21 percent of atmospheric gas is oxygen. Carbon dioxide, however, is found in relatively small amounts (0.04 percent); therefore, the partial pressure for oxygen is much greater than that of carbon dioxide. The partial pressure of any gas can be calculated by: P = (Patm) (percent content in mixture). Patm, the atmospheric pressure, is the sum of all of the partial pressures of the atmospheric gases added together: Patm = PN2 + PO2 + PH2O + PCO2= 760 mm Hg. The pressure of the atmosphere at sea level is 760 mm Hg. Therefore, the partial pressure of oxygen is: PO2 = (760 mm Hg) (0.21) = 160 mm Hg, while for carbon dioxide: PCO2 = (760 mm Hg) (0.0004) = 0.3 mm Hg. At high altitudes, Patm decreases, but concentration does not change; the partial pressure decrease is due to the reduction in Patm . 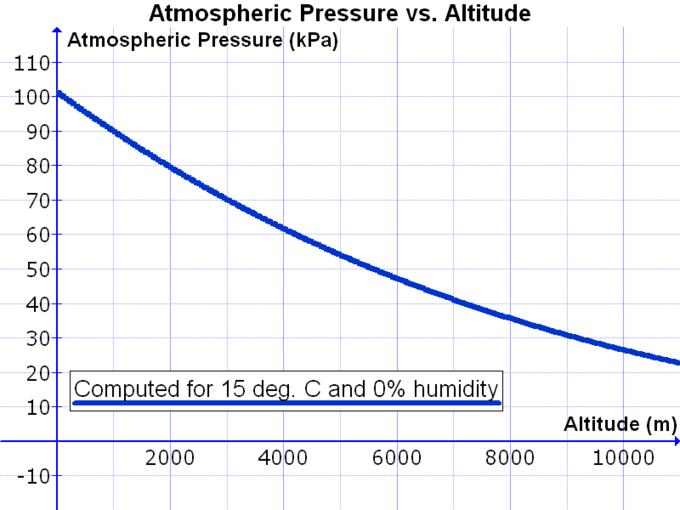 Atmospheric pressure vs altitude: At high altitudes, there is a decrease in Patm, causing the partial pressures to decrease as well. When the air mixture reaches the lung, it has been warmed and humidified within the nasal cavity upon inhalation. The pressure of the water vapor in the lung does not change the pressure of the air, but it must be included in the partial pressure equation. For this calculation, the water pressure (47 mm Hg) is subtracted from the atmospheric pressure: 760 mm Hg 47 mm Hg = 713 mm Hg, and the partial pressure of oxygen is: (760 mm Hg 47 mm Hg) 0.21 = 150 mm Hg. These pressures determine the gas exchange, or the flow of gas, in the system. Oxygen and carbon dioxide will flow according to their pressure gradient from high to low. Therefore, understanding the partial pressure of each gas will aid in understanding how gases move in the respiratory system. The purpose of respiration is to perform gas exchange, a process that involves ventilation and perfusion and that relies on the laws of partial pressure. The purpose of the respiratory system is to perform gas exchange. A gas will move from an area where its partial pressure is higher to an area where its partial pressure is lower, and the greater the difference in pressure, the more rapidly the gases will move. Ventilation is the movement of air into and out of the lungs, and perfusion is the flow of blood in the pulmonary capillaries. For gas exchange to be efficient, the volumes involved in ventilation and perfusion should be compatible. The purpose of the respiratory system is to perform gas exchange. Pulmonary ventilation provides air to the alveoli for this gas exchange process. At the respiratory membrane, where the alveolar and capillary walls meet, gases move across the membranes, with oxygen entering the bloodstream and carbon dioxide exiting. It is through this mechanism that blood is oxygenated and carbon dioxide, the waste product of cellular respiration, is removed from the body. In order to understand the mechanisms of gas exchange in the lung, it is important to understand the underlying principles of gases and their behavior. In addition to Boyle’s law, several other gas laws help to describe the behavior of gases. Gas molecules exert force on the surfaces with which they are in contact; this force is called pressure. In natural systems, gases are normally present as a mixture of different types of molecules. For example, the atmosphere consists of oxygen, nitrogen, carbon dioxide, and other gaseous molecules, and this gaseous mixture exerts a certain pressure referred to as atmospheric pressure (Table 2). Partial pressure (Px) is the pressure of a single type of gas in a mixture of gases. For example, in the atmosphere, oxygen exerts a partial pressure, and nitrogen exerts another partial pressure, independent of the partial pressure of oxygen (Figure 1). Total pressure is the sum of all the partial pressures of a gaseous mixture. Dalton’s law describes the behavior of nonreactive gases in a gaseous mixture and states that a specific gas type in a mixture exerts its own pressure; thus, the total pressure exerted by a mixture of gases is the sum of the partial pressures of the gases in the mixture. Partial and total pressure of a gas: Partial pressure is the force exerted by a gas. The sum of the partial pressures of all the gases in a mixture equals the total pressure. Partial pressure is extremely important in predicting the movement of gases. Recall that gases tend to equalize their pressure in two regions that are connected. A gas will move from an area where its partial pressure is higher to an area where its partial pressure is lower. In addition, the greater the partial pressure difference between the two areas, the more rapid is the movement of gases. Henry’s law describes the behavior of gases when they come into contact with a liquid, such as blood. Henry’s law states that the concentration of gas in a liquid is directly proportional to the solubility and partial pressure of that gas. The greater the partial pressure of the gas, the greater the number of gas molecules that will dissolve in the liquid. The concentration of the gas in a liquid is also dependent on the solubility of the gas in the liquid. For example, although nitrogen is present in the atmosphere, very little nitrogen dissolves into the blood, because the solubility of nitrogen in blood is very low. The exception to this occurs in scuba divers; the composition of the compressed air that divers breathe causes nitrogen to have a higher partial pressure than normal, causing it to dissolve in the blood in greater amounts than normal. Too much nitrogen in the bloodstream results in a serious condition that can be fatal if not corrected. Gas molecules establish an equilibrium between those molecules dissolved in liquid and those in air. The composition of air in the atmosphere and in the alveoli differs. In both cases, the relative concentration of gases is nitrogen > oxygen > water vapor > carbon dioxide. The amount of water vapor present in alveolar air is greater than that in atmospheric air (Table 3). Recall that the respiratory system works to humidify incoming air, thereby causing the air present in the alveoli to have a greater amount of water vapor than atmospheric air. In addition, alveolar air contains a greater amount of carbon dioxide and less oxygen than atmospheric air. This is no surprise, as gas exchange removes oxygen from and adds carbon dioxide to alveolar air. Both deep and forced breathing cause the alveolar air composition to be changed more rapidly than during quiet breathing. As a result, the partial pressures of oxygen and carbon dioxide change, affecting the diffusion process that moves these materials across the membrane. This will cause oxygen to enter and carbon dioxide to leave the blood more quickly. 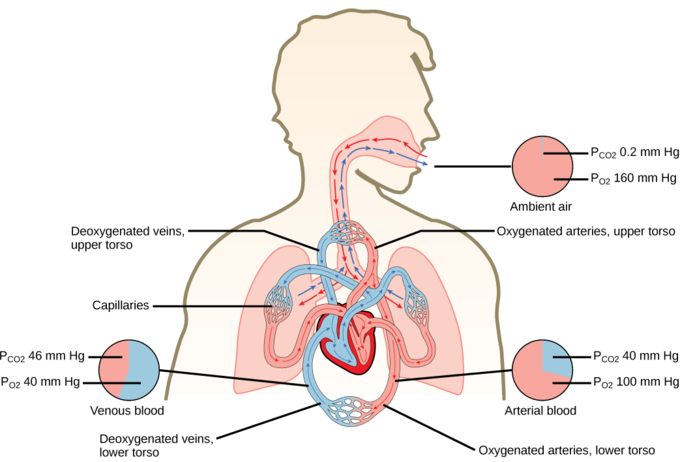 Gas exchange: This illustrates the exchange of gas in humans between a capillary and an alveolus. Two important aspects of gas exchange in the lung are ventilation and perfusion. Ventilation is the movement of air into and out of the lungs, and perfusion is the flow of blood in the pulmonary capillaries. For gas exchange to be efficient, the volumes involved in ventilation and perfusion should be compatible. However, factors such as regional gravity effects on blood, blocked alveolar ducts, or disease can cause ventilation and perfusion to be imbalanced. Lung volumes measure the amount of air for a specific function, while lung capacities are the sum of two or more volumes. The lung volumes that can be measured using a spirometer include tidal volume (TV), expiratory reserve volume (ERV), and inspiratory reserve volume (IRV). Residual volume (RV) is a lung volume representing the amount of air left in the lungs after a forced exhalation; this volume cannot be measured, only calculated. The lung capacities that can be calculated include vital capacity (ERV+TV+IRV), inspiratory capacity (TV+IRV), functional residual capacity (ERV+RV), and total lung capacity (RV+ERV+TV+IRV). Different animals exhibit different lung capacities based on their activities. For example, cheetahs have evolved a much higher lung capacity than humans in order to provide oxygen to all the muscles in the body, allowing them to run very fast. Elephants also have a high lung capacity due to their large body and their need to take up oxygen in accordance with their body size. Human lung size is determined by genetics, gender, and height. At maximal capacity, an average lung can hold almost six liters of air; however, lungs do not usually operate at maximal capacity. Air in the lungs is measured in terms of lung volumes and lung capacities. Volume measures the amount of air for one function (such as inhalation or exhalation) and capacity is any two or more volumes (for example, how much can be inhaled from the end of a maximal exhalation). Human lung volumes and capacities: The total lung capacity of the adult male is six liters. Tidal volume is the volume of air inhaled in a single, normal breath. Inspiratory capacity is the amount of air taken in during a deep breath, while residual volume is the amount of air left in the lungs after forceful respiration. The volume in the lung can be divided into four units: tidal volume, expiratory reserve volume, inspiratory reserve volume, and residual volume. Tidal volume (TV) measures the amount of air that is inspired and expired during a normal breath. On average, this volume is around one-half liter, which is a little less than the capacity of a 20-ounce drink bottle. The expiratory reserve volume (ERV) is the additional amount of air that can be exhaled after a normal exhalation. It is the reserve amount that can be exhaled beyond what is normal. Conversely, the inspiratory reserve volume (IRV) is the additional amount of air that can be inhaled after a normal inhalation. The residual volume (RV) is the amount of air that is left after expiratory reserve volume is exhaled. The lungs are never completely empty; there is always some air left in the lungs after a maximal exhalation. If this residual volume did not exist and the lungs emptied completely, the lung tissues would stick together. The energy necessary to re-inflate the lung could be too great to overcome. Therefore, there is always some air remaining in the lungs. Residual volume is also important for preventing large fluctuations in respiratory gases (O2 and CO2). The residual volume is the only lung volume that cannot be measured directly because it is impossible to completely empty the lung of air. This volume can only be calculated rather than measured.. Lung volumes are measured by a technique called spirometry. An important measurement taken during spirometry is the forced expiratory volume (FEV), which measures how much air can be forced out of the lung over a specific period, usually one second (FEV1). In addition, the forced vital capacity (FVC), which is the total amount of air that can be forcibly exhaled, is measured. The ratio of these values (FEV1/FVC ratio) is used to diagnose lung diseases including asthma, emphysema, and fibrosis. If the FEV1/FVC ratio is high, the lungs are not compliant (meaning they are stiff and unable to bend properly); the patient probably has lung fibrosis. Patients exhale most of the lung volume very quickly. Conversely, when the FEV1/FVC ratio is low, there is resistance in the lung that is characteristic of asthma. In this instance, it is difficult for the patient to get the air out of his or her lungs. It takes a long time to reach the maximal exhalation volume. In either case, breathing is difficult and complications arise. The lung capacities are measurements of two or more volumes. The vital capacity (VC) measures the maximum amount of air that can be inhaled or exhaled during a respiratory cycle. It is the sum of the expiratory reserve volume, tidal volume, and inspiratory reserve volume. The inspiratory capacity (IC) is the amount of air that can be inhaled after the end of a normal expiration. It is, therefore, the sum of the tidal volume and inspiratory reserve volume. The functional residual capacity (FRC) includes the expiratory reserve volume and the residual volume. The FRC measures the amount of additional air that can be exhaled after a normal exhalation. The total lung capacity (TLC) is a measurement of the total amount of air that the lung can hold. It is the sum of the residual volume, expiratory reserve volume, tidal volume, and inspiratory reserve volume.. Differences in partial pressures of O2 create a gradient that causes oxygen to move from the alveoli to the capillaries and into tissues. The change in partial pressure from the alveoli (high concentration) to the capillaries (low concentration) drives the oxygen into the tissue and the carbon dioxide into the blood (high concentration) from the tissues (low concentration), which is then returned to the lungs and exhaled. Once in the blood of the capillaries, the O2 binds to the hemoglobin in red blood cells which carry it to the tissues where it dissociates to enter the cells of the tissues. The lungs never fully deflate, so air that is inhaled mixes with the residual air left from the previous respiration, resulting in a lower partial pressure of oxygen within the alveoli. In the human body, oxygen is used by cells of the body’s tissues to produce ATP, while carbon dioxide is produced as a waste product. The ratio of carbon dioxide production to oxygen consumption is referred to as the respiratory quotient (RQ), which typically varies between 0.7 and 1.0. If glucose alone were used to fuel the body, the RQ would equal one, as one mole of carbon dioxide would be produced for every mole of oxygen consumed. Glucose, however, is not the only fuel for the body; both proteins and fats are used as well. Since glucose, proteins, and fats are used as fuel sources, less carbon dioxide is produced than oxygen is consumed; the RQ is, on average, about 0.7 for fat and about 0.8 for protein. In the lungs, oxygen diffuses out of the alveoli and into the capillaries surrounding the alveoli. Oxygen (about 98 percent) binds reversibly to the respiratory pigment hemoglobin found in red blood cells. These red blood cells carry oxygen to the tissues where oxygen dissociates from the hemoglobin, diffusing into the cells of the tissues. More specifically, alveolar PO2 is higher in the alveoli (PALVO2=100mmHg) than blood PO2 in the capillaries (40mmHg). Since this pressure gradient exists, oxygen can diffuse down its pressure gradient, moving out of the alveoli and entering the blood of the capillaries where O2 binds to hemoglobin. At the same time, alveolar PCO2 is lower (PALV CO2=40mmHg) than blood PCO2 (45mmHg). 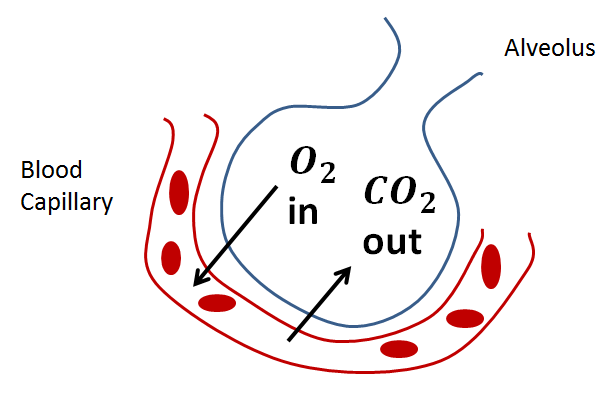 Due to this gradient, CO2 diffuses down its pressure gradient, moving out of the capillaries and entering the alveoli. Oxygen and carbon dioxide move independently of each other; they diffuse down their own pressure gradients. As blood leaves the lungs through the pulmonary veins, the venous PO2=100mmHg, whereas the venous PCO2=40mmHg. As blood enters the systemic capillaries, the blood will lose oxygen and gain carbon dioxide because of the pressure difference between the tissues and blood. In systemic capillaries, PO2=100mmHg, but in the tissue cells, PO2=40mmHg. This pressure gradient drives the diffusion of oxygen out of the capillaries and into the tissue cells. At the same time, blood PCO2=40mmHg and systemic tissue PCO2=45mmHg. The pressure gradient drives CO2 out of tissue cells and into the capillaries. The blood returning to the lungs through the pulmonary arteries has a venous PO2=40mmHg and a PCO2=45mmHg. The blood enters the lung capillaries where the process of exchanging gases between the capillaries and alveoli begins again. Partial pressures: The partial pressures of oxygen and carbon dioxide change as blood moves through the body. In short, the change in partial pressure from the alveoli to the capillaries drives the oxygen into the tissues and the carbon dioxide into the blood from the tissues. The blood is then transported to the lungs where differences in pressure in the alveoli result in the movement of carbon dioxide out of the blood into the lungs and oxygen into the blood.